Great Saunas, a Waterloo, Ontario based sauna manufacturer, has been in business for over thirty-five years. Their 30,000 square foot factory/showroom carries one of the largest collections of saunas in North America, but you don't have to visit their factory to view an incredible array of saunas offered at wholesale prices. They have a website that could very well be one of the largest sauna websites on the Internet. There are literally hundreds of pages of information about every kind of sauna imaginable, including traditional Finnish models, interior and outdoor models, rustic cabin styles, and modern, far infrared saunas. 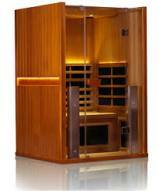 In fact, they offer over 100 models of the twelve most popular saunas. Most of these are constructed from red cedar and are extremely well-built and attractive. The Great Saunas website features dozens of articles about saunas, including helpful guidelines you can use to decide which type is best for you and your family. 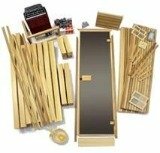 You can order pre-fabricated models, kits with blueprints, or design your own sauna. This last option is what sets them apart from other sauna manufacturers. If you have a concept in mind, you can send it to Great Saunas, where one of their design experts will create a finished design complete with blueprints, schematics and a materials list. UPDATE: Great Saunas is no longer in business. Check out our Top Home Sauna Brands for all of your sauna-related needs. If you aren't sure what you want, but know how many people will generally be using it; take the time to browse through an impressive collection of schematics for inspiration. You can choose from among hundreds of designs. We love the detailed schematics and blueprints - they give you so much more information than simply looking at a nice photo of a sauna. The website also has a nicely organized FAQs section that can answer most, if not all, of your questions about installing a sauna in your home. The answers are usually written by Pertti Olavi Jalasjaa, a Finnish native with years of sauna building experience. 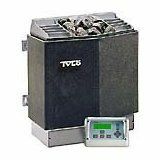 Great Saunas also carries a complete selection of heaters, rocks, buckets and other accessories. 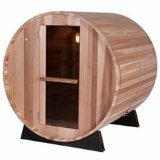 If you're having trouble finding a replacement part for your current sauna, be sure to check out this website. They carry parts and accessories from virtually every manufacturer. With over sixty heaters to choose from, you're practically guaranteed to find one that will work for you. They don't limit themselves to traditional parts; you can find electric, wood burning and far infrared heaters as well as the rarer vaporizer models. The wholesale pricing can hold its own or beat most competitors. They frequently run special sales on various models, so if you have a particular style in mind, you might consider visiting the site each week for several weeks to see if the model you're considering has been marked down. The pricing and quick delivery make Great Saunas a valuable sauna find for anyone in the U.S. or Canada, but the most impressive about the company may well be the website. You could spend hours reading about saunas and browsing through photos and floor plans, creating your own, unique sauna in your head. The best part is, they can take that sauna in your head and translate it into reality.